I’d often heard of this pretty classic crime novel, but I’d never read it. However, it was on my ereader, and I was settled in for a looong car journey, so I randomly picked it up and got going. It’s a very easy read: the language is simple, to the point, which helps to define the narrative voice. More flowery language wouldn’t work with the character. Once it gets to a certain point, parts of the plot are obvious, but the trick pulled in court is amazing. It’s a simple story, in one sense — guy meets married woman, they want to get rid of her husband — but the tangle of passion and brutality stands out more against the relatively simple plot (except for the bit in court, which is less simple). 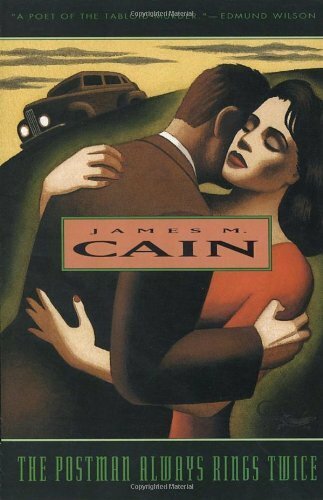 Definitely worth reading if you enjoy crime fiction and have missed out on James M. Cain thus far. Where now? I read quite a bit today, Chuck Wendig’s Irregular Creatures and James M. Cain’s The Postman Always Rings Twice. Reviews for both of those are coming up on the blog (though you can see them on Goodreads/Librarything already, in the unlikely event that you’re desperate). 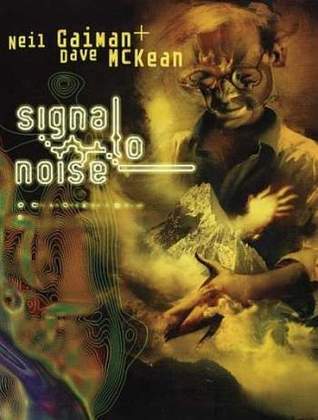 Before that it was Neil Gaiman and Dave McKean’s Signal to Noise, from Netgalley. I’m probably going to break off from the aforementioned backlog to read The Dark is Rising, since it’s exactly the right time of year for it and there’s a readathon going on via Twitter to celebrate the 40th anniversary. I might even start that this evening. Other than that, I want to read more of Alan Bradley’s books (they are on the list), and I’m hoping to finish Lauren Beukes’ Zoo City, Rosie Best’s Skulk and Julianna Scott’s The Holders in relatively short order. It’s Christmas, so I have duly been acquiring. Well, that and the Kindle Daily Deal… I forget exactly what I’ve got there altogether, but basically some fantasy/SF stuff that looked interesting. For Christmas so far, I got Jaine Fenn’s Principles of Angels and Consorts of Heaven from my friend Lo, and from my Librarything Secret Santa I got Chris Wooding’s Retribution Falls and Jack McDevitt’s The Engines of God, which seem likely to prove very good picks. I got Signal to Noise from Netgalley, presumably for whatever release is current or about to happen. It’s not great, reading it on screen: the resolution wasn’t great, and I think it probably looks better as a bunch of two-page spreads. Nonetheless, it tells a powerful story, and it’s a very thoughtful one: this isn’t a graphic novel in the sense of comics with superheroes and over-powered fight scenes, bulging muscles, etc. This is a meditation on art and death, and consequently life. I’m not the greatest fan of Dave McKean’s art here, but it worked for this particular story. Not super-exciting, but more made for slow reflection. Some other blogs I follow do this meme, every Tuesday, and it seemed like a good idea. So! This week the top ten theme picked by The Broke and the Bookish is “top ten new-to-me authors in 2013”. This is pretty hard — I’m rubbish at picking top tens — but hey, with this one I just need to use Goodreads and look among my four and five starred books for this year, and hopefully I should be able to figure something out. They will not, I warn, be in any particular order. Cassandra Rose Clarke. I loved The Mad Scientist’s Daughter, which reminded me of a more daring, personal The Positronic Man (Isaac Asimov & Robert Silverberg). All sorts of themes which I love, and there’s something so powerfully sensual about it, too — there’s a physicality to it that surprised me and moved me. Georgette Heyer. I think I may technically have read one or two of her detective novels in 2012, but I kept away from her Regency romances, because I thought that was obviously not my thing. How wrong I was! The Talisman Ring, The Reluctant Widow and The Grand Sophy were probably my favourites. Heyer’s romances are actually way more fun (for me) than her detective novels, and often wickedly funny too. Karen Lord. I’ve only read part of The Best of All Possible Worlds, but I’m enjoying it, and I really loved Redemption in Indigo. Folk-story type narration and structure, awesome female characters, etc. Martha Wells. I’ve only read City of Bones, but I loved it. Non-traditional gender stuff, avoids the easy way out, lots of tasty, tasty world building. I think I’ve bought almost all the rest of her books as a result. Franny Billingsley. Oh my goodness, Chime. Just, oh my goodness. I loved the narration, the magic, the things it said about abuse and surviving and living again. I also enjoyed The Folk Keeper and Well Wished — less so, and they’re less touching/heavy subjects, but they’re a lot of fun too. Arthur C. Clarke. Yeah, I know, I’m a bit late on this one. But I really enjoyed 2001: A Space Odyssey. I didn’t realise that I’d enjoy his writing style so much — I had him sort of filed away as maybe like H.G. Wells, interesting for ideas but not quite entertaining. Wroooong. Lord Dunsany. Yeah, again, I know. I read Time and the Gods and am determined to spend more time reading his stuff: it’s just the sort of mythic, rich stuff I can really dig into. C.J. Sansom. I’ve been meaning to read his stuff for quite a while, but this year I finally got round to it. I enjoy his writing style, and while there are bones I have to pick with the Shardlake books, I do enjoy his way of portraying that time period and his choice of protagonist. Chris F. Holm. About time another Angry Robot author showed up, doncha think? I love Dead Harvest, etc: it’s funny, it’s a good pastiche of Raymond Chandler, Dashiell Hammett et al., and the covers are amazing. I just had so much fun reading these books. David Weber. He and Aliette de Bodard fought a fierce battle for this last spot, but he won. I loved On Basilisk Station, despite many flaws I could find in it. I mean, ten pages of exposition slap bang in the middle of an epic space chase/battle. WHAT. But still. I love Honor and I’m looking forward to reading more of the series. I’m being good and sticking to the letter of the law: only a top ten. The top ten books I read in 2013 is coming up not next week but the week after: goodness knows how I’ll manage with that. But for now, off I go to bury my nose in the pages of I Am Half-Sick of Shadows (Alan Bradley). I’ve been meaning to read Little Brother for a long time, so when it came up for the SF/F course on Coursera, it seemed like it was finally time. Maybe it got built up a bit too much over time, because I found it fairly disappointing. There’s something very immature about it — in some ways, that’s part of its charm, because it’s enthusiastic and straightforward and the characters/plot are earnest. But. While I enjoy Cory Doctorow’s non-fiction writing (he writes very clearly about copyright, piracy, etc), I haven’t enjoyed his fiction nearly as much. He seems to write still partly in a non-fiction mode: we get lectured about the world he’s setting up, rather than seeing it in action. It’s like a thought experiment, a way of playing out his concerns. There’s a place for that, of course, but it’s a lot easier to swallow when it’s wrapped up in prose like that of Ursula Le Guin. This probably is a fairly direct comparison to books like Charlotte Perkins Gilman’s Herland: it’s a story born of convictions more than of the urge to tell a story, I think. 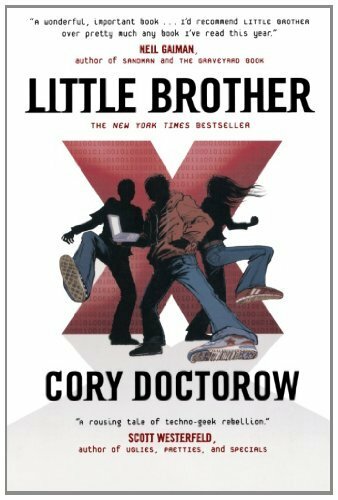 For a reader who is used to Cory Doctorow’s work and already interested in this kind of thing, the narrator’s explanations are unnecessary, and even for those who are not, it’s a bit heavy-handed. Doctorow’s writing is clear, and he gets his points across… but for me, that was a trade off against flow and interest. I don’t really see why people found this so fascinating and absorbing, I’m afraid. One of my Christmas presents: a subscription to Flash Fiction Online. I was really interested in this, because flash fiction is something I’m good at and something I really enjoy: you have to be clever, and choose every word just right. You have to know just what to leave out. It’s not a form I’ve seen people pay much attention to, but it’s a form I love to play with, and to read when it’s done well. Unfortunately, there was nothing really special in this month’s issue. The second story, Mercedes M. Yardley’s ‘Milk and Moonshine’ was probably the best, though it required a bit more editing (even a single typo will stand out in a piece of flash fiction). It is nice, however, that there seems to be a willingness to play mix and match with genres, and accept anything that’s interesting. I might end up submitting to this publication myself; it’ll be interesting to see it develop. I read this for Bruce Holsinger’s historical fiction course on Coursera. 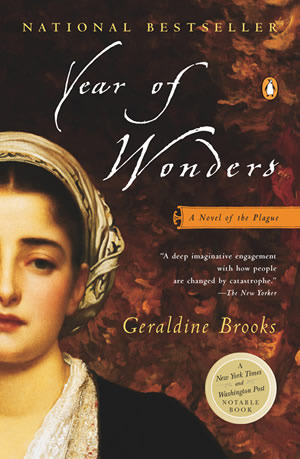 It’s based on the true story of the village of Eyam, during the 1665 epidemic of plague in Britain, though Geraldine Brooks doesn’t stick too closely to the names and details of exactly what happened there, but rather tries to recreate the sense of it. For her own comfort, I think, even where she’s based her characters on real people, she’s taken them a step or so away from them so that William Mompesson becomes Michael Mompellion, allowing her to take greater liberties. At times, it seems pretty melodramatic, to me. The whole situation between Michael and Elinor, for example, seemed completely unnecessary (and barely even seemed to make sense to me); sometimes it just seemed to pile too much into the story that on its own would’ve seemed to make sense. The ending was worse; it felt like a complete flight of fantasy beside the historically grounded, patiently explored situation in the village. So… overall, parts of this are a very powerful exploration of the tensions and also the support in Eyam at the time, and of the faith and fear and superstition of the time. But other parts of it work against the simple, touching aspect that those things give the story. I know it’s fiction and flights of fantasy are all a part of it, but it didn’t feel right to me. 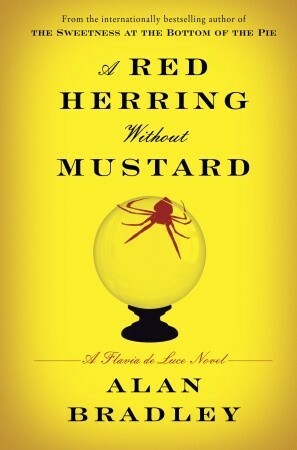 I’m somewhat torn on the subject of Flavia de Luce. I find the books fun to read, but the hail-fellow-well-met Englishness (as portrayed by a Canadian writer who never went to England prior to starting on the first book). It’s just a total fantasy, and I can never tell how seriously people are taking it. One thing that is bothering me is Flavia’s relationship with her sisters. It’s played lightly, yet it’s frankly abusive. She’s constantly being told that no one loves her, no one would want to spend time with her, that she’s frankly unworthy of love… and I can’t tell how seriously people (including Alan Bradley) are taking that. There’s more than a touch of Dahl’s Matilda in Flavia, but it never seems to get any deeper than that. At this point, I’m starting to want to know why Flavia’s sisters treat her that way, what effect this is really having on Flavia, whether this is just meant to build up a picture of a “quirky” family (ugh), or whether it’s meant to be leading somewhere. Playing pranks is one thing, even fighting, but psychological warfare? It’s really starting to get on my nerves. 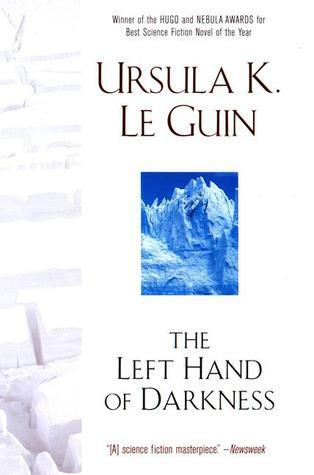 Reread this for my SF/F class on Coursera. I loved it more, this time: read it slowly, appreciated the details, just as the professor suggested. Partially because, of course, I knew it would be rewarding with Ursula Le Guin. I don’t think I was ready for this book when I read it before: the fierce joy and love in some parts of it, the devastation, the making-strange of familiar things and the making familiar of strange things. Some parts were… maybe less subtle than I thought Le Guin would be. All the stuff about Orgoreyn seemed fairly obviously a commentary on the relations between the US and Russia; the portrayal of Karhide was more subtle, but the Voluntary Farm seems a fairly naked commentary on the gulags. I expected more subtlety, really. I do love the world Le Guin builds. I was impatient with it last time, but having experienced more of her work, all the detail and background is part of the picture, part of the creativity, not ancillary to the plot. Don’t read this if you’re not ready to be shaken up about gender, but really, that isn’t the important thing about it. The real importance of it is not the way Le Guin plays with and reflects on gender (Tehanu would be equally important for that, I think), but the way she thinks about dualism/wholeness, the imagery of Yin and Yang which her whole story invokes. Firstly, I think I’ve mentioned this before, but oh I love the cover art so much. It’s done by Kinuko Craft, who has also illustrated at least some of Juliet Marillier’s covers, so that explains why it seemed familiar. 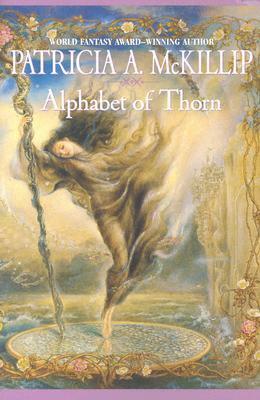 Alphabet of Thorn is beautifully written. It’s one of those books where it’s less about making things happen, and more about watching them happen — there is some degree of “stopping things happening”, but mostly people fall in love, and do magic, and learn things about themselves, and work in the slow silent world of manuscripts and translation, and… It’s not really about the plot, I think, but more about the characters and the world; less about things happening than about people in a situation. I don’t know if I can describe it — but all the same, I hope it’s clear that I loved it. The mythical parts of the story, the floating school of magic, all of it felt — not real, but true, to me. It all worked seamlessly as a world, as a story. It also felt in some ways like something Ursula Le Guin could write (which is a very high compliment in my world): the Floating School is a cousin to the school on Roke. If you’re not a fan of McKillip’s style and plotting, I don’t think this one could change your mind. But I do think it’s gorgeous.